Some facilities require a higher level of security than others. Banks, law offices, government offices, military installations and corporate research centers all house sensitive material that can create security risks when they fall into the wrong hands. Access to these facilities is usually restricted, and only the most trustworthy cleaning service providers should be allowed to get in direct contact with the insides of these high security buildings. 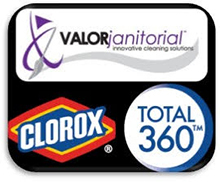 Valor Janitorial is exactly that kind of cleaning service contractor. We have a long and successful track record of rendering secure and professional office cleaning and janitorial services to both private and government-run facilities in North Texas. Our team of cleaning experts are not only highly trained in the science of making sure your building is neat and germ-free; they’ve also been taught to observe the proper procedures whenever they’re inside a high security facility. Valor Janitorial uses the latest cleaning processes and state of the art equipment to deep-clean any workplace without compromising its contents. We perform our services according to your schedule and we do so with relative expediency. We strive to cause as little interruption to your workplace as possible, all the while keeping it safe and sanitary at all times. We provide the most advanced and state-of-the-art commercial cleaning services in North Texas. Please call our friendly and knowledgeable staff for a free estimate. Or, if you like, contact us with any of our easy to use website contact forms.